Little Mrs. Married: Books, books, books! My in-laws are moving soon...into a smaller place. Because of this, they're getting rid of a lot of stuff they don't need. For my mother-in-law, this means getting rid of some books. My mother-in-law is an avid reader, and lucky for me we like the same kinds of books. She gave me a big bag of the books she is getting rid of & told me to take any if i wanted them. Embrace Me was good. Really good. It's kind of strange... it kind of goes back & forth between ladies that are a part of a traveling circus... they are a part of this circus because they are different. One of them has a burned face. The other is a quadripelegic. They are "freaks" (their words) & make their money by allowing people to come stare at them. The story goes back & forth between them and a man who is in a state of depression & despair because of the mistakes he made as a pastor. He is seeing the error of his ways & desperate for change in his life...or to end his life. This book eventually ties the two groups together, when at first you're wondering what in the world these people have in common. But their stories come together & along with it? Grace. Redemption. Love. I have always seen books by Lisa Samson, but hadn't read anything by her. It was a good story. She's a good writer. I will read something by her again. 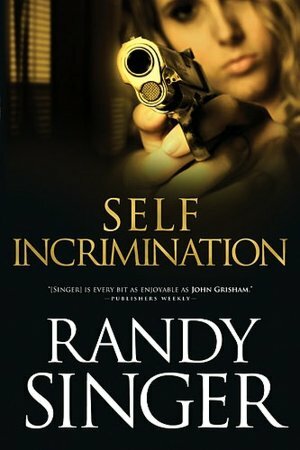 After that, I read Self-Incrimination, by Randy Singer. I loved it. I LOVED IT. I don't usually read mysteries or novels about crime. I reserve that for TV, as you may have guessed with my Law & Order SVU obsession. I am so glad i read this book though. It's a christian novel about two lawyers who are engaged & the murder trial they are working on... it's GOOD. After i finish this huge stack, and after i read Emily Giffin's book that just hit bookshelves (I LOVE HER! ), i will definitley be reading more of his books! 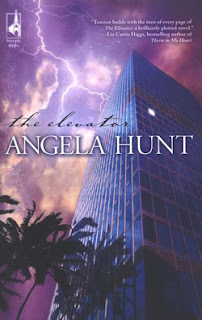 I am currently reading The Elevator, by Angela Hunt. I can't wait to see what happens to these three women stuck in an elevator together! They are rushing back to an office when a hurricane is on its way. There's nobody out in the streets, most have evacuated, and these three ladies are running back to a hotel room. My guess? The SAME hotel room... it's pretty crazy, actually. But i will do a review once i finish it! Speaking of books... i have a giveaway going on here. I pick a winner tomorrow night! Self incrimination looks really good! I may have to check that one out! I read The Elevator a long time ago and loved it! Man I wish I had more time to read...I'm spending too much time watching the Olympics!! !